A composite shield forms the main part of the crest. The field is black (sable) and red (gules), parted vertically (party per pale) by an oak leaf. The other charges are a hurley and sliotar in the black section and a football in the red section. The leaf is green (vert) and the other charges are white (argent). A crown and hound in gold (or) form the Crest on top with the motto Áth Trasna Abú at the bottom. 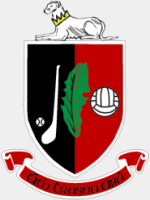 The Black and Red are self explanatory, the club colours, as are the hurley, sliotar and football. The crown, hound and oak leaf represent Cú Roí Mac Daire, a mythical Munster king, whose cult has survived to this day in the Parish of Newmarket. Cú (hound) in his name is a symbol of his stature as a great warrior. It is also associated with courage, vigilance and loyal fidelity. The crown around the hound signifies royalty. Mac Daire (Son of Oaktree) suggests that he also had magic powers, with the oak leaf also being a symbol of antiquity and strength. It is said that Cú Roí Mac Daire lived in Taur and met his death there at the hands of Cu Chulainn through the treachery of a woman. The Motto Áth Trasna Abú is at the bottom of the crest. Áth Trasna being the irish name for Newmarket and Abú meaning To Victory! A battle cry. Áth Trasna Abú Newmarket To Victory!